All tourists to Kenya require a tourist visa which costs USD 50 per person and can be obtained on entry (visa fees must be paid in USD only) or in advance from Kenya embassies abroad. A transit visa is available for a USD 25 fee. It is advisable to check with your doctor at least a month before your travel to get recommendations and advice. Anti malarial drugs are strongly recommended. It is most recommended that all travellers arrange their personal travel insurance to cover medical, property and other personal risks for the duration of their holiday and safari. Temporary membership of the Flying Doctor Service, based in Nairobi and providing cover in Kenya and northern Tanzania can also be arranged at a modest cost. The official languages of Kenya are Kiswahili and English. Most of our driver guides, hotel staff, etc. speak also German, French and other languages. Moreover, 42 tribal languages are spoken all over Kenya. The Kenyan currency is Kenya Shilling (KSh). 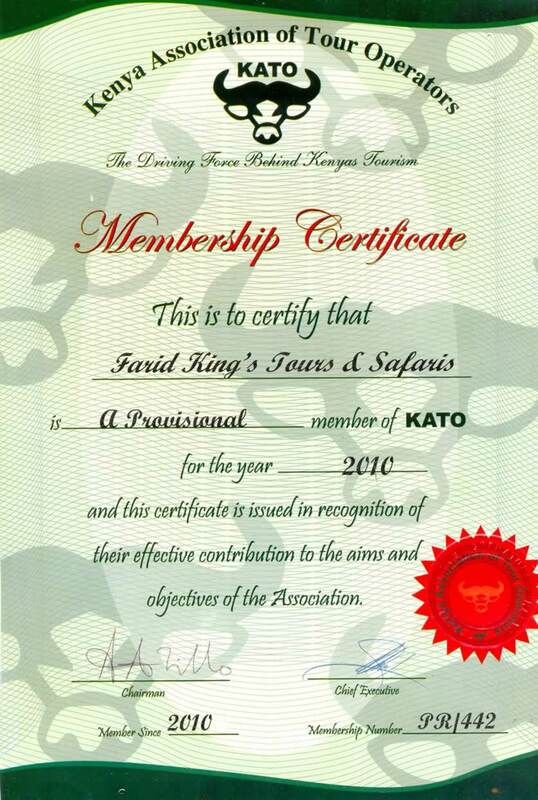 Payments for safaris can also be made in EUR, USD, GBP and others. There are numerous banks and bureaux de change in towns, and most lodges and hotels will exchange currency or travellers cheques at reasonable rates. Items or services are priced and paid in aforesaid currencies, so there is no need to convert more funds into the local currency than you need for incidental expenses. Travelers cheques are widely accepted. Credit cards are accepted in some establishments. The use of credit cards in banks gives only KSh. The power supply is at the UK/European standard voltage of 220/240, and power sockets are the U.K. square pin type. To use U.S. appliances a voltage convertor and a plug convertor will be needed. Mains power supply is subject to cuts and voltage fluctuation. On safari, most lodges' power supplies are from generators, and these are often turned off during parts of the day and night to reduce noise and fuel consumption. It is recommended to drink only bottled mineral water which is available everywhere. Kenya is an equatorial country, hence little seasonal variation in temperature which is experienced between coastal and low lying regions, and the high plains and mountain regions. There are two seasons: dry season and rainy season with long rains in April and May, and short rains in November. In practice, the rainfalls are unpredictable. Generally, during rainy seasons, the rain often falls in heavy but brief tropical downpours during the evening or night with pleasant sunny days in between. There are local buses and minibuses which are likely to be uncomfortable, overcrowded and potentially dangerous. Better hotels generally have a superior selection of taxis available, and it is suggested that you obtain one of these, particularly for longer journeys. There is a railway link between Nairobi and Mombasa just on specific days, i.e. Mondays, Wednesdays and Fridays, and these are night journeys. Generally, there are no restrictions on the sale or consumption of alcoholic drinks, however, in some areas like Muslim villages alcohol is restricted. Any single month of a year is interesting for safari. - from July to mid September. 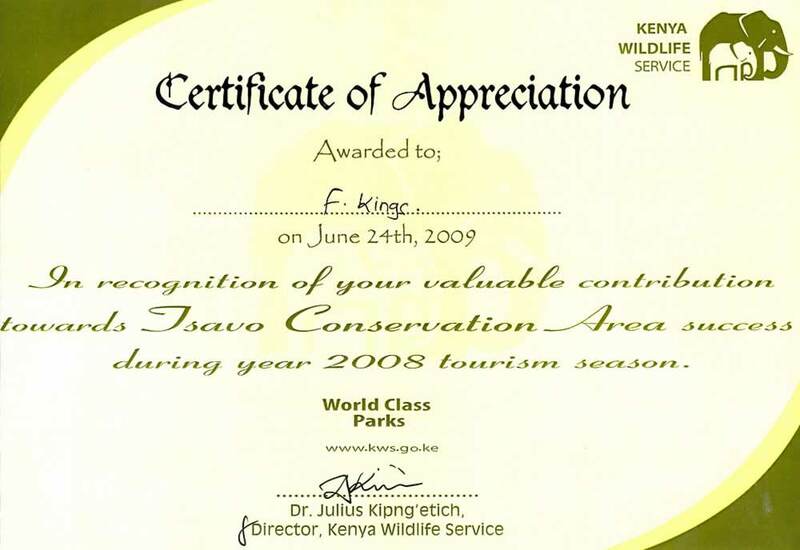 We offer safaris all over the year, including the rain season, i.e. April, May and June, during which good discounts are offered. Please contact us for details. Between January and February wildebeest and zebras give birth and gather in south Serengeti in Tanzania. From March the large herds start to move north and west in search of fresh grazing through Serengeti towards Masai Mara in Kenya, and remain there for 3 months (August – October). Then, they return to south Serengeti in November. Rooms in lodges and tents in permanent tented camps share the same facilities, i.e. beds, toilet and shower, etc., all what we assure you is high standard accommodation. Please be advised that tented camps are in general more expensive than lodges, due to low capacity, luxury and more adventurous nature. Most of lodges/camps spray rooms and provide mosquito nets, but your own insect repellent sprays may appear necessary. Most of lodges and camps have their own swimming pools. For single travellers there is always a supplement to cover the costs of single accommodation. It is not recommended for children under 2 years to go for safari, due to long trips on rough and bumping roads. Children under 12 will benefit from reduced fares on scheduled airlines. All lodges provide an additional bed for a child sharing a room with parents at a reduced cost. A few of the most expensive permanent tented camps do not allow children under 12 years of age. The game parks have a pleasant climate with warm days and cooler evenings and early mornings. It is, therefore, advisible to carry with you also a pullover or jacket for evenings and mornings. Clothes for safari should be light, comfortable and not too brightly coloured. There is little or no requirement for anything formal. A jacket or pullover is needed in the evenings and early mornings, at higher altitudes. Comfortable walking shoes, a hat and sunglasses are essential. Do not forget a swimming costume for use at the lodge/camp swimming pools. Binoculars, zoom cameras and video equipment with plenty of tape or film are extremely useful. Camera films are also available at lodges/camps. A flashlight is also useful. Please limit your luggage for safari to the most needed stuff, due to limited space in vehicles and plains. Our safari vehicles are equipped with HF-radios, so that drivers can communicate with our base, each other and lodges/camps. Most lodges/camps have telephone, but the service, particularly for overseas calls, is quite expensive. Game parks are rarely within mobile phone range, but satellite telephones work anywhere. It is upon guests to tip the safari driver guide after safari. It is, however, common to give about a USD 5 tip per day per person. There is a departure tax on international flights of USD 40 this will generally have been included and already paid in the price of your ticket. There is a small local departure tax payable in cash at the airport/ airstrip for local flights. For more tips and information, please contact us. Wildlife safaris are extremely popular holidays for tourists from around the globe as they appeal to all age ranges, from the young to the old alike. Safaris should offer you a memorable holiday beneath the African sun, under the expert guidance of your driver and tour guide. Booking the right tour is crucial; if your driver has little experience of finding the wildlife and educating visitors about their habitats, your safari holiday will be adverselyaffected. F. Kings Tours and Safaris employ highly experienced guides and drivers who all speak several languages including English, German, Spanish, French and Italian. Under this knowledge and experience, and by following a few simple tips, guests can enjoy their safari of a lifetime. To see the great migration on safari, the best time to visit Kenya is either between January and March or July and October. During these months theherds can be seen on the Maasai Mara as they follow the food. Kenya enjoys temperatures of between the high 70s to mid 80s and 50 to 60 degreesduring the mornings and evenings, and it is blessed with a good climate year round. The coastal and southern areas of the country experience hotterconditions and there are two rainy seasons during the year in April and May and short rains at the end of the year. The dry season is the best time to see the wildlife because they come to the water holes regularly and here you will spot many varieties of animals and birds. What to wear is an important factor on Safari. Guests should stick to casual clothes that are lightweight and, above all, comfortable to wear. Layers are a good idea, to cater for the early mornings and late evenings. Cotton tee shirts, shorts and cargo pants are ideal for safari, along with a fleece or cotton jacket for the nights. Don’t forget to bring a hat and comfortable walking shoes with soles that are thorn proof. Along with your passport, you may need a visa to enter Kenya and this should be done as soon as possible, to avoid delay. Make sure your visa iscurrent for your trip and check that your passport has not expired. You do not need inoculations for Kenya, but if you intend to travel beyond the country, you should check to see which immunizations you need. Mosquito repellent with at least 30 per cent DEET is strongly advised and long sleeved shirts and pants are handy for avoiding bites. A cover policy for your trip is essential, whatever your age, as it will protect you from medical mishaps or lost or stolen baggage. There are particularly good offers available for the over 65s that feature a higher level of medical cover, giving you peace ofmind while you are abroad. Remember to pack your traveler’s cheques, cash and any credit or debit cards you intend to take to Kenya, along with maps of the area and perhaps a tablet or smartphone for the trip. The time of day is crucial for spotting wildlife. Because the animals seek shelter from the midday sun, the best times to see them are at dawn and dusk when they visit the watering holes and are more active. The success of your safari depends on the number of animals you see, particularly the ‘Big 5’such as lions and elephants. Your driver and guide will have a good idea where the wildlife is, from radio contact with colleagues along the way. Ifanother guide has spotted something worth seeing, they will pass on the news and a network of knowledge and advice goes back and forth to make sure your Safari experience is optimized. Keep your eyes open and remember to look up into the trees. There may be a leopard snoozing on a branch after a kill. Rivers contain crocodiles that are camouflaged by the reeds so you have to look carefully to spot them. A wildlife map should show you the areas that particular animals frequent in the park and binoculars are a good idea too. Typically, the morning safari lasts until just before noon and the afternoon game drive will take you through to sunset, giving you ample opportunities to photograph the wildlife you see while you are out. Because many national parks prohibit visitors leaving the vehicles they travel in, your photography needs to be taken from your seat and the road is often bumpy and dusty so you need to wait until the vehicle is stationary. Whilst thismay be restrictive, it does mean you can bring along some camera support if you wish, in the form of a heavy 600mm lens, which you then need tosteady in the car. Beanbags are popular in Kenya for steadying your camera on the side of the vehicle so that you can shoot quality pictures. A 300mm lens or longer should give you the definition you need. Composition is important in Safari photography; try to feature something in the foreground to add depth, such as a tree. If you want to capture the panorama of the landscape and cannot do so in one shot, take several photographs of different parts of the image and when you get home you can join them together to create a stunning piece of digital photography that captures your Safari perfectly.